Along one side of Virunga National Park in the Democratic Republic of Congo, a fence lines a sorghum field where a family of gorillas readies for a nap a few hundred feet away. Virunga, Africa’s oldest national park, is about double the size of Rhode Island. It’s home to hundreds of the world’s 880 wild mountain gorillas. But agricultural encroachment poses a major threat. Fields of crops are creeping into the habitat of the park’s wildlife, so there’s less forest — and less food, water and shelter — for the animals. After the 1994 genocide in neighboring Rwanda, 2 million refugees fled to eastern Congo, creating enormous demand for land, food and resources. 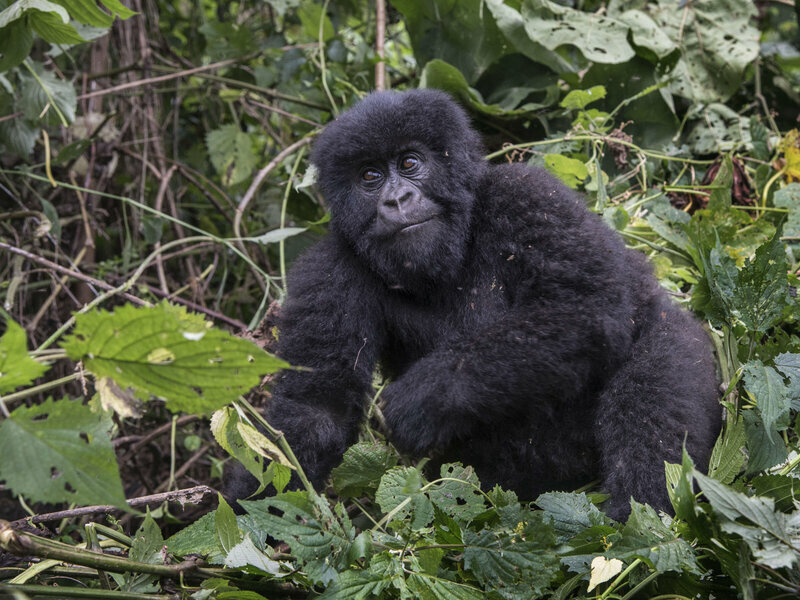 This 1-year-old is part of the mountain gorilla population in Virunga National Park in the Democratic Republic of Congo. One nonprofit, Partners for Seeds in Africa (PASA), is aiming to stem this encroachment through improved farming. The Nairobi-based group, backed by American philanthropist Howard Buffett, son of Warren Buffett, is introducing high-yield “hybrid” seeds for corn, soybean, beans and rice that can increase crop productivity when used with fertilizer. “There’s a growing population, farmers want more land, yields are decreasing and farmers use poor methods for planting and seeds,” says Juan Whiting, seed systems coordinator in Rwanda for the Conflict and Development Foundation. This is why, Whiting says, PASA wants to “find new seed varieties to boost economies.” Whiting’s group, also backed by Howard Buffett, works with PASA on the program. Eastern Congo’s temperate climate is ideal for farming, but without access to high-yield seeds and fertilizer, small farmers produce only a seventh to a quarter their potential yield, according to PASA. And although the volcanic region is fertile, extensive farming is depleting the soil. But moving hybrid seeds into the market is easier said than done. High-yield seeds in Congo are normally imported from Uganda, but countries selling the seeds tend to keep the best for themselves and offer up poor-quality product. Congo must also deal with high import costs, fickle bureaucracy and political instability in this volatile region. Since 2014, PASA has helped launch four Congolese companies to produce improved seeds locally. The seeds are crossbred by international agricultural scientists to produce larger, healthier and hardier ears of corn. 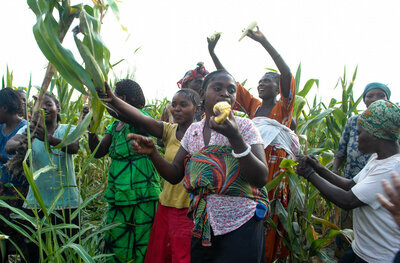 Farmers in eastern Congo greet visitors at a field of new hybrid corn. PASA selected four Congolese individuals from hundreds of applicants to launch the seed companies. Entrepreneurship is a fledgling concept in this region wracked by 20 years of conflict and war that has claimed 5 million lives. The seed company owners received business training, start-up grants of $150,000 a year and guidance in growing hybrid seeds, supply chain management, quality control, marketing and more. The four companies have produced 155 metric tons of high-yield corn, bean, soybean and rice so far this year — the goal is to produce 1,000 metric tons annually. PASA plans to eventually launch another six seed companies in Congo. Congo lacks the agriculture research prowess of other countries in the region such as Kenya. But PASA is supporting local government institutions, like the National Institute for Agronomic Study and Research (INERA), to focus more research on seed varieties that will work best in Congo. It is also awarding Congolese agriculture scientists scholarships for graduate degrees in Kenya so they can return after their studies to develop improved seeds at home. So far, six people have taken part in this program and four more are slated for next year. It can take up to 10 years to develop high-yield seeds suited for local climate, altitude, soil and rainfall. But because they have collaborated with regional researchers, including those in Kenya, Congo is expected to launch its own variety of hybrid corn next year. In many countries, farmers’ dependency on agricultural “inputs” — seeds and fertilizer — can be a controversial subject. One concern is creating a cycle of farmers, especially poor ones, paying for inputs. Another concern is overusing fertilizer and its impact on health and the environment. But small Congolese farmers hardly use any fertilizer, if any at all. In Africa, farmers on average use about 17 pounds of fertilizer per 2.5 acres, according to PASA. “That’s way too low,” Ininda says. It’s also unclear whether high-yield seeds will keep farmers from encroaching on Virunga. The potential for more productive crops could tempt them to claim more parkland, though it is illegal to do so. PASA also faces the challenge of creating consumer demand and a market for both improved seeds and fertilizer. Small farmers accustomed to their traditional techniques must be convinced to buy seeds instead of replanting the corn they grow or relying on free seeds from aid organizations. One kilogram — about 2.2 pounds — of high-yield seeds costs $2.50, though with PASA subsidies, farmers pay $1. And seeds must be evenly spaced and used with fertilizer to yield larger crops. Instructions must be clear for farmers who might be illiterate. “Farmers are slow to accept new changes. That’s a challenge,” Whiting says. But PASA has been educating thousands of farmers through demonstration plots and other initiatives and plans to hold 20,000 demonstrations of improved corn this year. Thousands of farmers attended a July launch ceremony of the new seeds in Rugari, a village near Virunga National Park. Kavira Kahamulwa Celestine, a 42-year-old farmer, has been working on a demonstration farm that grows the new seeds. “I was surprised to see this seed producing so much,” she says.